Online registration has begun for IBPS Clerk Exam 2016 (CWE VI). Interested and eligible candidates can apply at the official portal of IBPS (ibps.in). Application form along with the fee can be submitted online on or before 12 September. 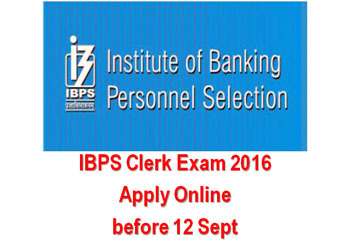 Institute of Banking Personnel Selection (IBPS) has begun the online registration process for the CWE Clerk VI exam. Registered candidates will be eligible to appear for the examination for recruitment to the post of Clerks in all the participating organizations. Any eligible candidate, who aspires to join any of the Participating Organisations as a Clerk or in a similar post in that cadre, is required to register for the Common Recruitment Process (CWE Clerks -VI). The online registration for the IBPS CWE Clerk VI exam will continue till 12 September. Application fee should also be submitted within this time period. The different participating banks are Allahabad Bank, Canara Bank, Indian Overseas Bank, UCO Bank, Andhra Bank, Central Bank of India, Oriental Bank of Commerce, Union Bank of India, Bank of Baroda, Corporation Bank, Punjab National Bank, United Bank of India, Bank of India, Dena Bank, Punjab & Sind Bank, Vijaya Bank, Bank of Maharashtra, Indian Bank and Syndicate Bank. A total of 19243 vacancies have been notified by IBPS in all the above mentioned banks for all the States/ UTs. The examination will be two tier i.e. the online examination will be held in two phases, preliminary and main. Candidates who will qualify in preliminary examination and shortlisted will have to appear for Main examination. The preliminary examination will be online based and will be held on 26-27 November, 03-04 December 2016. The result is expected to be declared on December 2016. The IBPS CWE Clerks VI will be a two tier examination i.e. Preliminary and Mains, preliminary examination will be of 01 hour duration of 100 marks and candidates will be tested on the their knowledge of English language, Numerical Ability and Reasoning in Preliminary examination. The IBPS mains examination will be of 2 hour 15 Minutes duration and will of 200 marks and candidates will be tested upon their knowledge in Reasoning, English Language, Quantitative Aptitude, General Awareness, and Computer knowledge. Candidates will have option to attempt the examination in either Hindi or English Language. Candidate should have completed Graduation degree or equivalent in any discipline from a recognised university and should have operating and working knowledge of computers systems and should have Certificate/Diploma/Degree in computer operations/Language/ should have studied Computer/ Information Technology as one of the subjects in the High School/College/Institute. Candidate should be proficient in the official language of the State/ UT for which candidate whishes to apply. Ex-Servicemen should be minimum matriculate and should have obtained the Army Special Certificate of Education or corresponding certificate in the Navy or Air Force after having completed not less than 15 years of service in the Armed Forces of the Union as on 12 September 2016. Candidates should note that since recruitment in clerical cadre in Public Sector Banks is done on State/UT-wise basis, candidates can apply for vacancies in any one State/ UT only. Consequently, a candidate would be required to appear for CWE in any one of the centres in that particular State/UT. However, candidates may be allotted to a centre of examination outside the chosen State/UT due to administrative reasons. Please note this reallocation is only for the conduct of examination and the candidate will be considered for vacancies in the State/UT applied for, as aforesaid. Candidates are required to apply online. Candidates should have scanned copies of photograph and signature, in the mentioned dimensions. Candidates should also have a valid personal email id. The email id should be kept active till the completion of this round of Common Recruitment Process. Application along with the fee is required to be deposited (Rs 600 for all; Rs 100 for SC/ST/PWD/EXSM candidates).